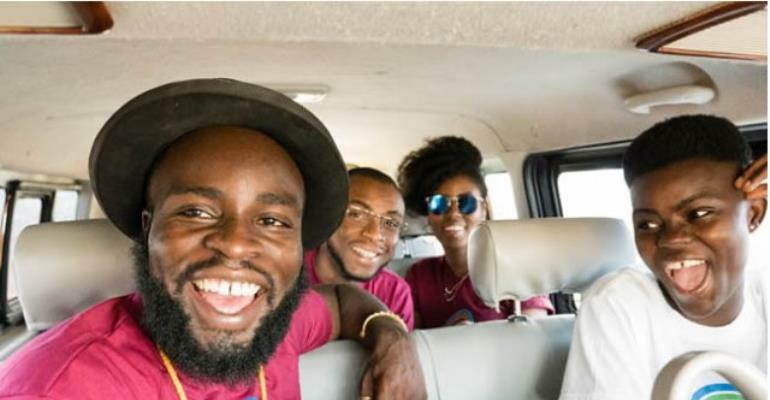 Kwame Tsikata, the Afropop rapper known by stage name M.anifest, Vera Hamenoo-Kpeda popularly known as MzVee and songstress, Noella Wiyaala Nwadei, Wiyaala and ace sports broadcaster Gary Al-Smith have travelled over 600 kilometres to come to the Ketejeli school in the Kpandai district of the Northern Region. With close to two million followers between them on social media alone, these are some of Ghana’s biggest superstars. Typically, they are signed to perform on big stages but today, they have come to this small community of about 2,000 people to speak to the children. “I always see Wiyaala on TV. I sing Mzvee’s songs every day. Today I am seeing them. I think I am dreaming”, a girl says from the crowd of school children. She can’t seem to hold back her smiles from morphing into laughter. She is upbeat and raises a hand wanting to answer every question. So too are many of her mates seated. The children gathered here number about 50. A dozen others also wander around the corridors of the classroom just meters away. The thick mango trees on the compound cast a warm shade from the blazing sun. 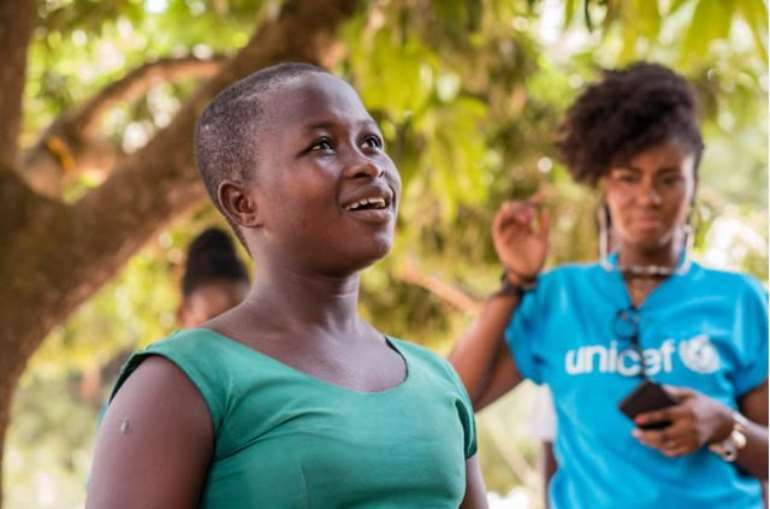 Abena Denteh is 16 and is talking about the first time she had her menstruation. The one asking the questions is MzVee, the popular dancehall songstress with fellow Afropop singer Wiyaala seated. “Sometimes, I have boys laugh at me in school that I have Asante Kotoko in my pantie because my period has soiled my dress with blood. It makes me want to go home”, says Abena, answering her third question. “Yes, yes its true”, her girlfriends raise their voices in support. 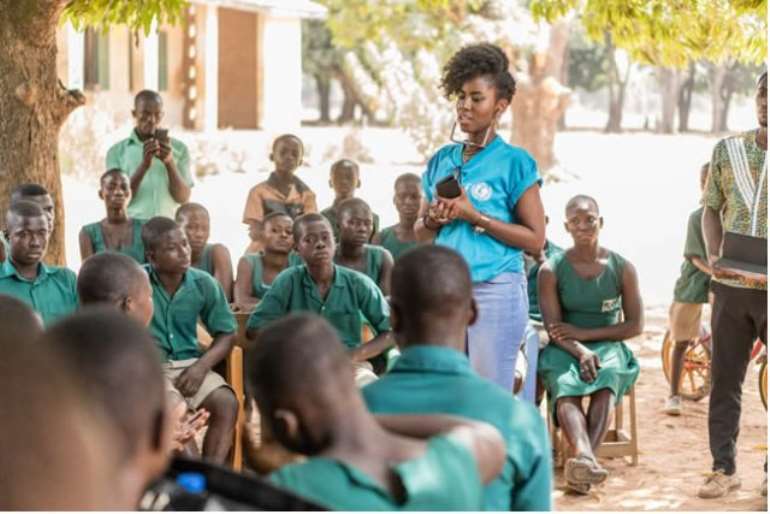 This school is one of the many in Ghana where UNICEF is helping address challenges facing adolescents in Ghana- mainly girls, with support from the Korean International Co-operation Agency (KOICA). “The Akans say it is adulthood that some haven’t yet reached but we’ve all been children before. So we are here to speak to you from our hearts. To lend a hand. So that you do not give up”, said Manifest. 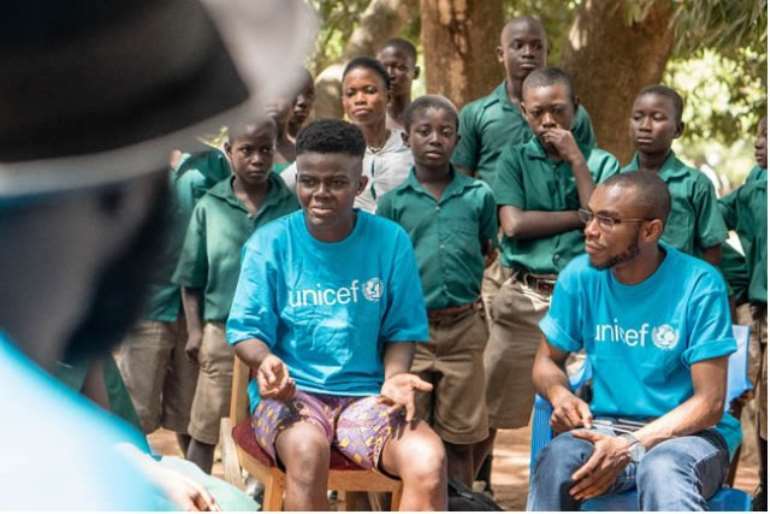 The stars who make up this influencer team have incredible stories- overcoming some of the most daunting challenges that stand between children in Ghana and their dreams. But Wiyaala, the Afro-pop songstress, has one that connects even more with that of the children of Ketejeli. “I could have been married at 12,” she says. Born in the Upper West regional town of Funsi-a village that did not even have electricity until five years ago, the conditions are very similar to this town. In this part of the country, one in every three girls is married before the legal age of 18. Nearly one in two of all adolescent girls aged between 15 and 19 years are anaemic – resulting in less energy and attention to engage in schooling, physical exercise. Just over one in three girls aged 15-19 years reported to have experienced at least one act of sexual violence in Ghana. The gloomy figures are worrying because about 5.5 million Ghanaians fall within this adolescent brackets. These may look like figures on paper but Wiyaala, growing up in Funsi, saw them in real life. “When I was growing up, girls had no say. Your only use is to be married off for your bride price. I saw many girls taken out of the classroom and handed out to men- usually older men”, she says. Today, she travels the world singing in her own Sisaali local dialect and has won for herself an array of global recognition including a feature on the CNN and BBC. The three regions in northern Ghana see some of the highest levels of poverty and inequality compared to other parts of the country- with at least one in four people living below the poverty line. That has implications for children and adolescents too. Like many of her friends, Abena said “if Wiyaala came from Funsi and has succeeded, then me too, I can make it”. “The opportunities that girls are offered, and the support they are given can play a vital role in their chances of success in the future. It is essential to give every girl the best start as she enters into adulthood,” she added. In all, KOICA is investing $5.2 million into this project as part of efforts to attain the Sustainable Development Goals (SDGs). This is to ensure that “by 2020 adolescent girls (aged 10-19) in Ghana should have knowledge, skills and enabling the environment to make informed decisions and achieve their full potentials”, says Yukyum Kim, Country Director at KOICA. Internationally acclaimed broadcaster, Gary Al-Smith also has his own fairytale story of how he made it from childhood in Mamprobi, one of Accra’s poorest and most deprived inner-city suburbs.